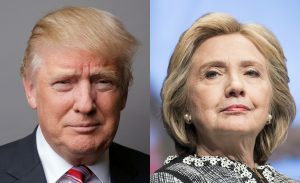 WASHINGTON — With a dozen days left until Election Day, Donald Trump and Hillary Clinton are refusing to commit to working with each other after the election, putting in question their abilities to heal the country’s wounds after a volatile presidential race. Clinton, meanwhile, dodged a question about whether she would meet one-on-one with Trump after the election. “I certainly intend to reach out to Republicans and independents, and the elected leadership of the Congress,” Clinton told reporters on her campaign plane Wednesday. Traditionally, presidential candidates hold a well-publicized meeting in the weeks after the election. While the moment of bipartisanship is often short-lived, the public appearance sends an important signal to the country that both parties are ready to accept the will of the voters and move forward. In 2012, President Barack Obama and defeated Republican nominee Mitt Romney shared an hour-long White House lunch of turkey chili and chicken salad. Four years earlier, Obama and Arizona Sen. John McCain pledged to work together on economic issues and national security after meeting in Chicago. In the final weeks of the campaign, both candidates have begun to focus more on their post-election plans. Trump made two appearances at his hotels this week, raising questions about whether he’s trying to shore up his corporate brand, amid signs that his campaign has hurt his family businesses. Trump has largely refused to back down from his defiant assault on the election’s integrity, remaining unwilling to say whether he’d accept the results if he loses. “Don’t worry about it,” he told ABC. He will visit Ohio for three campaign rallies on Thursday. Clinton, too, has turned some of her focus to what happens after Nov. 8, though her efforts assume she wins. Deep in transition planning, she’s begun retooling her campaign message to emphasize unifying the country after a divisive race. The survey shows her leading Trump nationally by a staggering 14 percentage points among likely voters, 51-37. That margin is the largest national lead for Clinton among recent surveys. But it’s consistent with trends in the race: Most polls have generally shown her ahead of Trump for the past several weeks. Clinton will campaign with Michelle Obama today in Winston-Salem, North Carolina, marking the first joint appearance for the two first ladies on the campaign trail. Obama’s appearances have become a key part of Clinton’s effort to fire up women, particularly black women for whom she’s a model and a source of pride.